There are many questions in life, which tend to pray on the mind in our most vulnerable hours. “How is that meeting going to go tomorrow”, “how can I fix my relationship” and “why are polo shirts called polo shirts“? We know, we have been wondering too! Which is why we decided to look into the history of this wardrobe stable for every big and tall man. A polo shirt, is best described, as a T-shaped garment with a knitted collar, short sleeves, a two or three button placket (the neck opening) and is generally made from a knitted fabric. But where and when was this knitted marvel invented and where does the horseback riding power-sport ‘polo’ come into play? The story goes, that back in the 19th and early 20th centuries, tennis players were bound to wear official “tennis whites” consisting of long-sleeved white button-up shirts (worn with the sleeves rolled up), flannel trousers, and ties. Understandably, this ensemble was not ideal for the athletic nature of the sport, or the general comfort of the wearer. 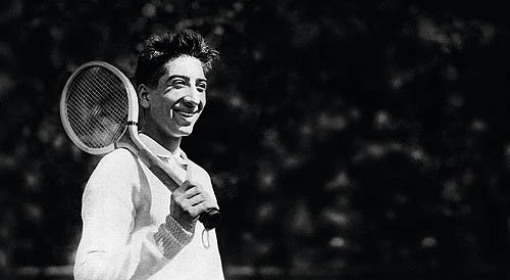 This was until one day, a young tennis star René Lacoste, had the vision of creating an item to be worn which would allow for less restriction, designing a white, short-sleeved, loosely-knit piqué cotton shirt, which was the early version of the style we know today. But where does the term polo come into play? Lacoste played tennis! Well, it appears when polo players heard of the revolutionary new design; they immediately adopted it for their own and used it exclusivly for their sport. In fact, Lacoste’s design was so dominant in the sport of polo that the term “polo shirt” became the universal name for his creation. Today, polo shirts are used in a variety of sports such as tennis and golf but have also found their place as a staple garment in the non-sporting world, commonly used as the primary design for school and hospitality uniforms. For the big and tall man, a good polo shirt provides endless options for ensembles and can be worn with almost anything. Ron Bennett Big Men’s Clothing has just received a new premium shipment of polo’s specifically designed with the big and tall man in mind. 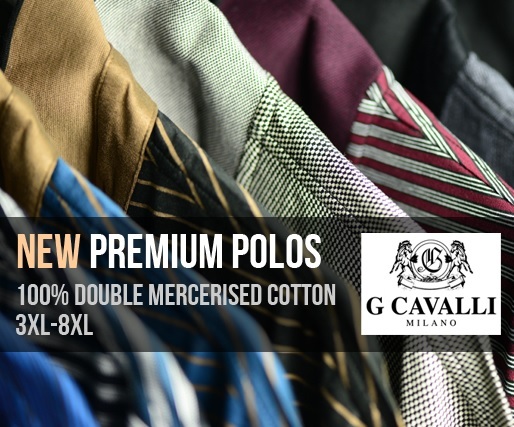 We personally favour the 100% Mercerised Cotton G. Cavalli polo. Mercerising treatment increases lustre, strength and affinity to dye makes the cotton fibre resistant to mildew. Apart from all these attributes this G. Cavalli polo also feels terrific on the skin. The natural fibre makes this smart polo very breathable suitable for a trans-seasonal piece that can be layered or worn on its own. The detailing on the collar draw the eye up, lengthening the ensemble, the G. Cavalli polo’s are the perfect addition to any wardrobe.